The Panama Canal took 4 years to expand and double its capacity. A new lane was added and the depth and width of the lanes and locks were increased and that enables bigger ships to enter. The locks (a system that lifts a ship up and down) were made approximately 21.3 metres (70ft) wider and approximately 5½ metres (18ft) deeper. In London on 24-28 October 2016, the 70th session of the Marine Environment Protection Committee discussed the negative impact the shipping industry has on the environment. The contribution of the Panama Canals reduction of emissions was shown at this meeting and the efforts of their Green Route Strategy and their incentives to get shipping vessels to reduce their GHG and carbon dioxide emissions. They do this with software that calculates emissions of CO2 that are released during the ships travel. This enables shippers to work out the most environmentally sustainable course around the oceans and because bigger ships enter the Panama Canal, the more cargo they can carry, and as a result further reducing CO2 emissions. Starting on the 1st of January 2017 Panama Canal users will be rewarded if they choose to participate in an Environmental Premium Ranking Scheme. To be involved in the scheme will ensure an improved position in the Customer Ranking position as well as improving the reduction of green-house emissions. This, in turn, will make shipping more productive and have a positive effect on the environment. 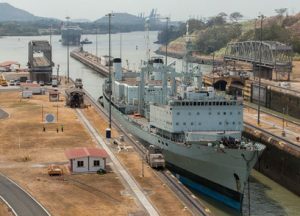 The Panama Canal now has an incentive scheme called Environmental Premium Ranking, to encourage their customers to meet high environmental efficiency standards so they can be rewarded by having their Customer Ranking position improved. The sole purpose for this program is to help reduce green-house gas emissions. The program includes the Green Connection Award and the Environmental Premium Ranking. The International Maritime Organisation set the standards for the highest environmental performance that Canal customers adapt to. And they will be honoured for their achievements for safe guarding the environment. The customer ranking is calculated by the number of passages the ship travels. They can improve their position if the vessel meets one of the requirements set by the Panama Canal. 1) EEDI (Energy Efficiency Design Index) begins, at minimum, below 20% of the reference line and for the International Energy Efficiency certificate, below 30% of their reference line. 2) A minimum of 35 points at the beginning of the ESI (Environmental Ship Index) and for the database a minimum of 80 points. 3) For NOx (Low Nitrogen Oxide) the vessel must be below Tier II limit of 10% minimum. And minimum limit for EIAPP (Engine Internal Air Pollution Prevention) Certificate below Tier II at 20% minimum. 4) Description of LNG (Liquid Natural Gas) fuelled engine. This is a natural gas that is toxic, odourless, non-corrosive and colourless. It is usually methane mixed with some ethane and uses up about 1/600th total of natural gas when it is converted to liquid. Panama Canal aims to encourage their customers to apply energy efficient designs to their ships and therefore contribute to global emission reduction.